Any guesses on how many times I heard that today from my Star Wars nerd? Well, it was more than once. He was pretty excited to learn that May 4th was Star Wars Day, and I'm pretty excited that he loves Star Wars as much as I did when I was a kid. This feels like an appropriate quote on a day like today when politicians act more like children than intelligent, caring adults who hold millions and millions of people's lives in their hands. I took another Facebook sabbatical this week. I just find myself a little depressed and not as nice when I spend too much time on there. And that's two weeks in a row that I have posted an NSYNC GIF to my blog for those of you scoring at home. Definitely not as bad as my David Hasselhoff phase back in 2005. I don't know what inspired the Hoff obsession, but if I had to guess, I'm thinking I might have been addicted to cocaine for a brief period of time. Or maybe I was sniffing too much glue. You have to love the spring weather in Idaho. In the 80s today and tomorrow and then 57 and rainy on Saturday. I don't think anyone would complain if we didn't get any more rain for a bit. 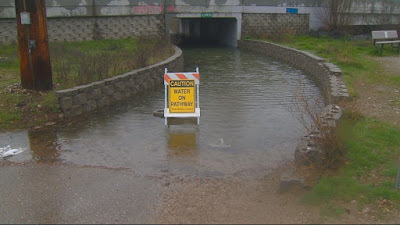 Here's a picture of the Boise Greenbelt, which is a recreational and alternate transportation trail that runs along the banks of the Boise River for about 25 miles. Most of it's closed because there's a little bit of water on the pathways. Little Johnny: "No ... I just feel bad that you're standing alone..."
Well that's all for this week. Have a good one and thanks for stopping by. Ha! Love that joke at the end. Take care. We have a thunderstorm coming that covers half the state. Jason was (is) a huge Star Wars fan too. Oh, yes. Star Wars day. All the nerds at the bookstore were excited! Shoot! I missed May the fourth be with you! Next year for sure. You do have a bit of moisture on the ground there, don't you? Yikes. The joke came at the right time... I was feeling utterly despondent until I read that. Thanks Matt. On occasion I think that maybe I've missed out by not being on Facebook, but that feeling usually passes. It was downright uncomfortable yesterday. Like geez Mother Nature, let us get used to the idea of summer before just ramming it down our throats! the hoff would make an excellent late night spokesman for in and out burgers. We got your kid liking Star Wars and you digging it because it's awesome - that's good. We got a funny joke capped off by a cartoon meme' of Mutley laughing - and that's also good.